Vijay Iyer (left) and Tyshawn Sorey at Q2 in New York on April 13. Q2 Music, a multi-platform home for musical discovery dedicated mostly to modern classical composition, hosted a program called Vijay Iyer & Friends on April 13, an event that saw the titular pianist, drummer Tyshawn Sorey, reedist Rudresh Mahanthappa, violinist Jennifer Koh and composer George Lewis congregate for a night of music and discussion. The evening played out like a live podcast recording, foreshadowing the upcoming Ojai Festival in California where Iyer is serving as music director for the 2017 edition. The program was streamed live on Facebook, and viewers can access the entire 101-minute program here. Beginning with a solo piano work entitled “Otoscopy,” a piece that dances around the idea of the out-of-body experience, Iyer oscillated between free play and form. At times chaotic, at times melodic, the tune eventually spiraled into something tangible and beautiful, so much so that a gentleman in the front row was called up onto the stage to discuss what he felt during the playing. Iyer would later admit that he’s had a number of out-of-body experiences over the course of his life, usually triggered by music. While playing the second part of this piece, Iyer delivered a central melody with his right hand and alternated bass notes and treble notes with his left hand. He attributed the influence of this unorthodox style of playing to Thelonious Monk, citing a 1966 video of Monk performing “Lulu’s Back In Town” that Lewis—who was seated in the front row—brought to Iyer’s attention. Iyer has never been shy to discuss Monk’s immense influence on his playing; however it was still a treat to hear Iyer discover new subtleties in Monk’s work. 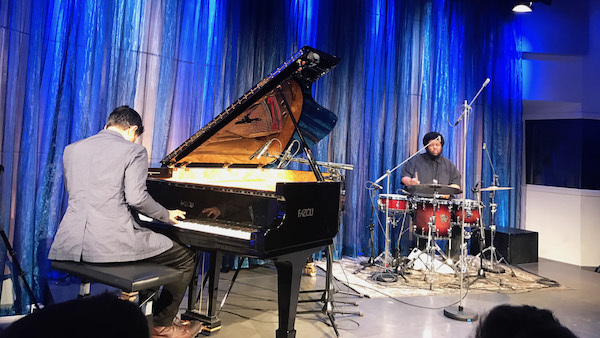 Drummer Tyshawn Sorey joined Iyer for the next piece, on which Iyer wove threads of avant-garde composition into a hip-hop tapestry (a recurring trope for the pianist). Iyer and Sorey, who share a long history together, have an uncanny ability to bring high-brow composition—avant-garde, classical, free-jazz—into more accessible context. This is exactly what happened during the nine-minute duet. The two will dig further into their musical chemistry with a run of shows at The Village Vanguard from May 9–14. Sorey and Iyer will also perform together at California’s Ojai Music Festival. Last year at the fest, Sorey debuted Josephine Baker: A Portrait. This year, he’ll assume the role of drummer in Iyer’s Trio, as well as conductor for the chamber piece Autoschediasms For Creative Chamber Orchestra. The four-day program is the common thread between the performers at Q2, who all play with Iyer, with the exception of Koh. Koh and Iyer, while they didn’t perform together for us on this night, do have a collaborative work in the making. Iyer has just finished writing a concerto for the violin marvel. That work isn’t quite ready, but Koh’s thrashing, experimental performance gave us a taste of what we could maybe expect from these two boundary-pushers. For the final performance, saxophonist/composer Mahanthappa joined Iyer on the stage. 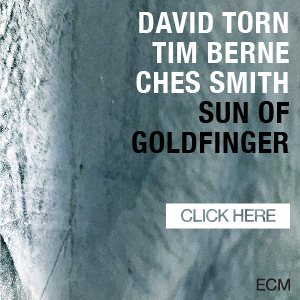 Mahanthappa was filling in for Wadada Leo Smith, who was originally on the bill to play a duet with Iyer, reprising their roles from last year’s acclaimed album A Cosmic Rhythm With Each Stroke (ECM). As a musical dialog partner, Mahanthappa made for a great chat. They went on to play two seamless pieces: Iyer’s “React” followed by Mahanthappa’s “Hope.” It combined for about 20 minutes of music in which the harmonious bond between the two progressive South Asian artists was on full display. Even in an intimate duo setting, they’re capable of producing great swaths of sound, tension and emotion. Trombonist/composer Lewis, who didn’t perform at the event but did take part in discussion, said, “I still like to go on stage when it’s the very coolest people [performing].” This is a good summary for an evening that hosted a Harvard professor (Iyer), a gentleman who’s about to receive a doctorate degree at Columbia (Sorey), that gentleman’s professor (Lewis), someone who holds a Master of Fine Arts degree from DePaul University (Mahanthappa), multiple Macarthur Fellows and more.